Dave Brown was born in Barnehurst, Kent, on 4 December 1957 the son of Arthur Leslie Brown, a teacher. “I've always drawn cartoons”, he later remembered: “When I was at school, I made up my own comic strips. I sat at the back when I was bored in lessons...caricaturing the teacher”. Brown studied Fine Art at Leeds University from 1976 to 1980, intending to be a painter, and after graduation worked as an art teacher at Strathcona Social Education Centre, Wembley, from 1980 to 1983. As a teacher he drew cartoons for the local union magazine in Brent, north London, where he lived. Brown then decided to become a full-time artist, and from 1983 to 1989 worked as a painter, freelance graphic designer, stage designer - and motorcycle courier. As he recalled, "I was living in a bedsit, painting enormous great panels that wouldn't fit in the room. I thought, 'I have to find a smaller art form.'" In 1989 he won the Sunday Times Political Cartoon Competition, and decided that "I should start taking cartooning a bit more seriously". 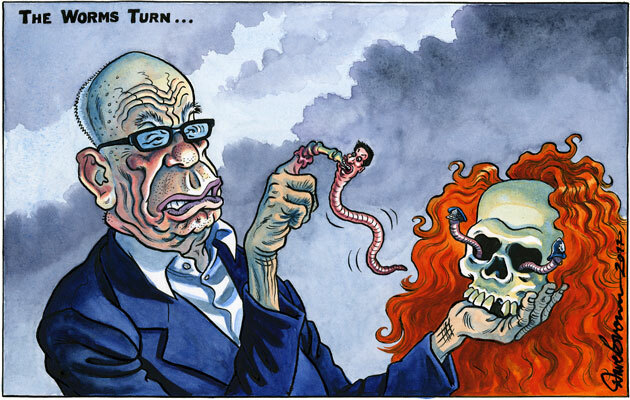 His first cartoon appeared in the Sunday Times on 11 June 1989, and he has been a full-time cartoonist ever since. 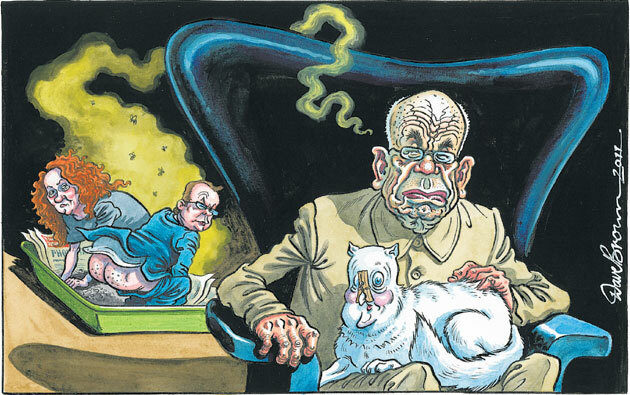 In 1996 he became political cartoonist on the Independent, and has also been a contributor to Daily Express (sports cartoons), Guardian, Scotsman, New Statesman, Sunday Times, Mail on Sunday (sports cartoons), Prospect, Economist and Financial Times. Brown regards himself as "a visual journalist", and his work can create controversy. When Tony Blair won the General Election of May 1997, he produced a cartoon of "Pin the Head on the Tory", suggesting that whichever candidate was elected "We All Lose!" This ran in the first edition of the Independent, but, as the scale of the Labour victory became apparent, the editor removed the final words, before dropping the cartoon altogether from later editions. 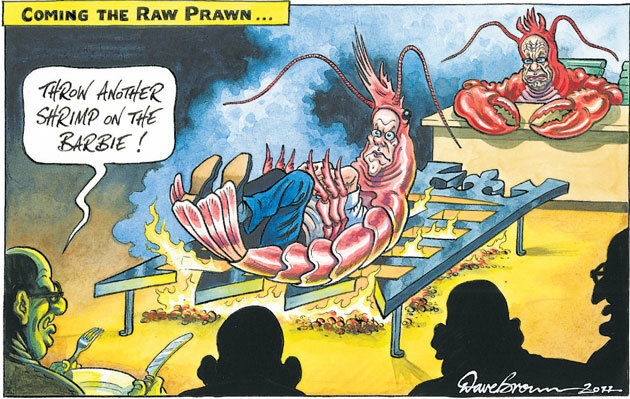 "No one has yet got a handle on Blair," Brown observed of his fellow cartoonists soon afterwards, "because everything has been so well managed that little of the personality has come through": "It was the same with Major before he was PM. The drawings made him look young and dashing." Brown, who was working freelance, left the Independent in August 1997, but returned a year later after a change of editor. His cartoons are a significant feature of the paper's political coverage, and his criticism of Israel's behaviour towards the Palestinians has sometimes provoked strong reactions. 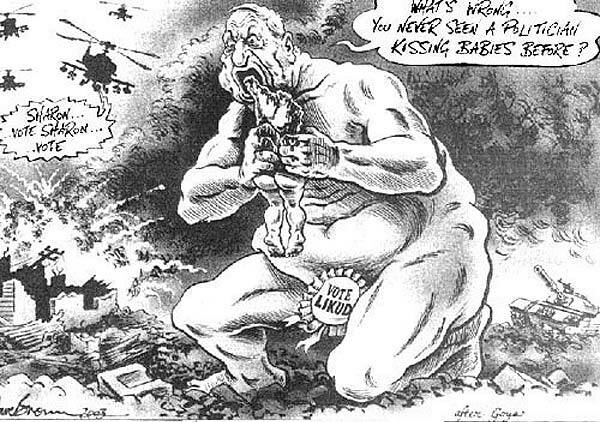 An Independent cartoon of 27 January 2003, drawn in the wake of an attack on Gaza City, showed Ariel Sharon eating a baby, and was attacked by the Israeli Embassy as an anti-semitic image "which would not have looked out of place in Der Sturmer." However, as Brown was careful to explain, his image of a political leader eating his own children was a direct reference to Goya's painting Saturn Devouring One of His Sons, and was simply "an attack on one person and his ideology": "If you start saying you can't criticise people because of the groups they belong to, you have no freedom." 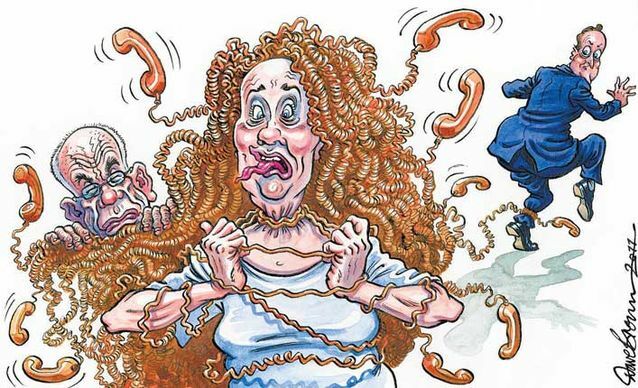 Brown argues that cartooning is "a way of taking back a little power from the bullies who run our lives", and believes that the essence of drawing politicians is to produce "something that niggles at them". "We shout 'The Emperor has no clothes'," he explains, "then, being cartoonists, we add 'and he has a ludicrously small willy.'" Brown used this tactic after John Reid became Health Secretary in 2003, and tried to limit the government’s smoking ban. In one cartoon Brown put a cigarette in his hand: "When we met he seemed quite annoyed about it and kept saying that he had given up smoking years ago. It was only meant to be a one-off but after I found out that it bothered him so much I put a cigarette in his mouth every time I drew him." Such repetition, he argues, is a valuable weapon to the cartoonist: "We're lone snipers in the book depository. Unfortunately, when you have a sharpened pen rather than a rifle, you have to hit them several times to have any sort of effect." As Brown argued in 2007, unknown or bland politicians were harder to caricature, for "lived-in faces are easier to draw": "It's not age so much, but character in the features, a bald head, big nose, glasses. You start by getting some sort of likeness - they've got to be recognisable - and then it's what you choose to stretch and exaggerate that says something about the character. When there's a leadership election cartoonists always think: who would be most fun to draw? You wouldn't choose David Cameron, he's so smooth and bland, like an overstuffed sausage skin." In 2008 Brown described his routine at The Independent: "The Today programme comes on at 6am and I lie half-asleep trying to ignore it, then I sit down with all the newspapers over breakfast. I have BBC News 24 on, too, which means that there are about three sources of news competing for my attention. At about 10.30am I call the comment desk. By that time, I'll have a shortlist of the main stories. I'll have a discussion with Adrian Hamilton, the comment editor, and between us we either alight on one story or choose two or three that are good, from which I decide the one I like best. Having decided on a topic, I just sit down and try to decide what I think about it, and how I'm going to approach it. Once I've got an idea I'm happy with, I do a rough pencil-sketch and fax it over to the desk for them to approve." Brown explains that cartoons are simply "one aspect of his interest in art." He regards James Gillray as "an artist of truly outstanding visual inventiveness", and sees himself as one of those British cartoonists who "still attempt to follow in his footsteps". Brown admired Les Gibbard’s cartoons for The Guardian, and admits to being "dazzled" by Ralph Steadman's work. He prefers to work with a dip pen and indian ink, sometimes also with watercolour, on Bristol board, though he also works on paper. 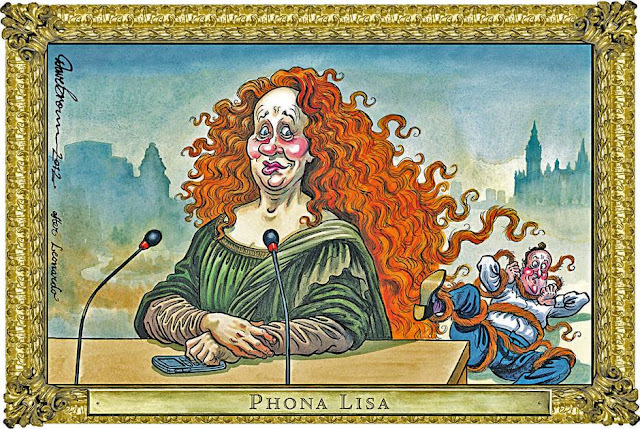 In 2002 Brown was voted Cartoon Art Trust Caricaturist of the Year. Jack O'Sullivan "Can you recognise this man? ", Independent, 12 May 1997, p.6. Mark Bryant Dictionary of Twentieth-Century British Cartoonists and Caricaturists(Ashgate, Aldershot, 2000), pp.39-40. Shuli Davidovich "Letter: Jewish Stereotype", Independent, 28 January 2003, p.17. 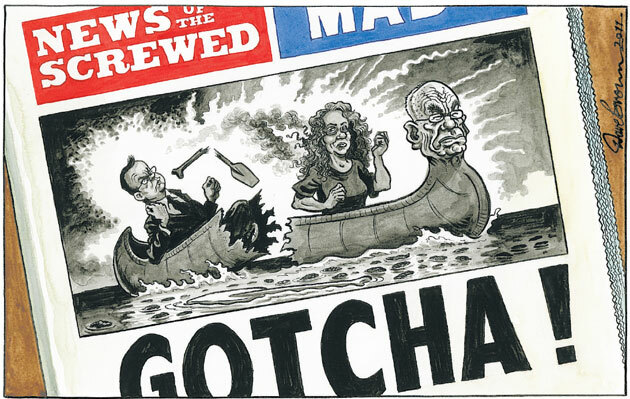 Dave Brown "The Cartoonist Writes...", Independent, 31 January 2003, p.6. Sara O'Reilly “Around Town - True blues”, Time Out, 31 January 2007, p.36. Dave Brown “Mightier than the sword”, The Independent, 18 June 2008, Extra p.2. 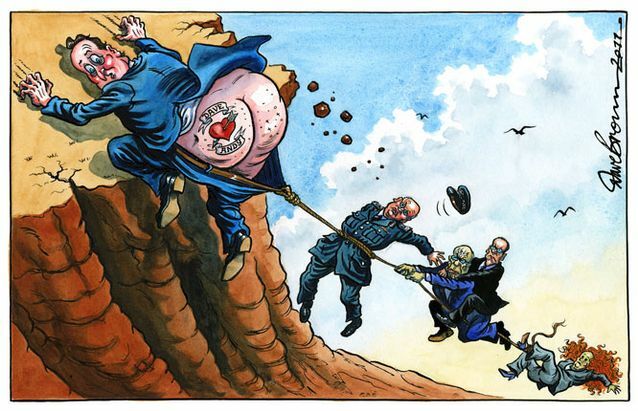 Dave Brown “I'm pleased when they hate how I draw them”, The Independent, 26 January 2009, p.12. 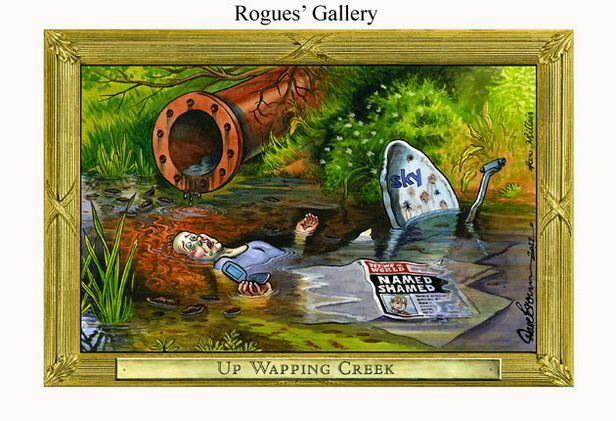 Dave Brown “We've only just begun to value his genius”, The Independent, 16 December 2009, p.14.